Ottawa receives San Jose's 1st in either 2019 or 2020 (not lottery protected); if the Sharks miss the playoff in 2018-19 it will be a 2019 selection, otherwise it will be in 2020. Should the Sharks sign Karlsson to a contract extension, Ottawa receives San Jose's 2nd in 2021, which would upgrade to a 1st (not lottery protected) if San Jose reaches the Stanley Cup Final in 2019. If Karlsson is on an Eastern Conference roster (reserve list) during the 2018-19 season, the Senators will receive an additional 1st from the Sharks no later than 2022. So if SJ trade Karlsson this year they owe Ottawa a "penalty" 1st. Too many picks for Ottawa to pass up by including Ryan? I'm stunned that they wouldn't accept Joe Vitale, Tanner Glass, and a 3rd. Man, we could have had him. Heck, throw in Taylor Pyatt. theblackarts wrote: I'm stunned that they wouldn't accept Joe Vitale, Tanner Glass, and a 3rd. Man, we could have had him. Heck, throw in Taylor Pyatt. *I like the penalty pick twist. Adding to the Karlsson trade, word from Renaud Lavoie of RDS is that JG Pageau is likely out 4-6 months after Achilles Tendon surgery. Sharks should be happy they missed out on Tavares. DelPen wrote: Sharks should be happy they missed out on Tavares. It’s not like Tavares would have been a bad get. He’s a year younger than Karlsson and wouldn’t have cost them any assets. He would replace an aging Thornton. Adding Karlsson is nice too though. Karlsson and Burns on the same roster seems a bit redundant to me, but we'll see how it goes for them. SubtropicalPenguin wrote: Karlsson and Burns on the same roster seems a bit redundant to me, but we'll see how it goes for them. Yeah I'm wondering how well they'll bond but having 2 offensive "D" ain't bad unless one is like he who shall remain nameless and forgets to actually play defense. Sam Reinhart signs a bridge deal. 2 years, 3.65M AAV. That could help drive the price down on Guentzel a bit. Has anyone done a study measuring players production before and after contracts? Lets say the year before and the year after. Just curious. theblackarts wrote: Has anyone done a study measuring players production before and after contracts? Lets say the year before and the year after. Just curious. Not a study, but I have noticed the final year of a contract the player has a "career year" or substantial boost in performance. Reason why you see so many huge contact players be disappointment after they go back to their norm after the career year. I've also noticed that the first year after a huge contract extension, the player will try and do too much and be worse for maybe half a season to a full year. Mostly happens with young guys and their first huge contacts, Dumoulin struggled a bit for example. Artemi Panarin has informed Columbus that he intends to test the free agent market next summer, and will not be signing with Columbus. Initial reports state that Kekalainen has no intention of trading him. Panarin had given Columbus a soft September 19th deadline to figure something out (trade, contract, what type of sandwiches to order, etc), otherwise he was moving on from contract talks. FLPensFan wrote: Artemi Panarin has informed Columbus that he intends to test the free agent market next summer, and will not be signing with Columbus. Initial reports state that Kekalainen has no intention of trading him. Over/Under on how many times in the next year that someone says we should go after him? My guess is somewhere in the thousands. I don't think he'd want to come to Pittsburgh, so it's a moot point every time it comes up. If he's telling the truth about Columbus, then he seems to want to be more of a big city guy......LA, NY, Chicago, Miami, etc. That would be a pretty stacked lineup. If I were Florida, I'd offer something like Bjugstad, a high end prospect like Owen Tippett, and a 1st round pick for Panarin and a 2nd (Florida currently has no 2nd or 3rd pick). Jason Mackey has a piece today talking about Letang, and how it appears Letang is going to crank his game back up to 11. The article talks about his neck injury affecting him, but, also the fact that Penguins management had asked him to dial back his game a bit (due to all the injuries) and take less risks out on the ice. From Letang's comments, it didn't work last season and he doesn't think he can try to play that way. Says that's not what got him drafted, and not his style. He needs to play his style. Perhaps because of the neck issue, but also because of his age (31 now) and a laundry list of previous injuries, the Penguins asked Letang to tweak his game last season. They wanted him to take fewer risks and, as a result, fewer big hits. Sullivan didn’t want Letang to change his game; he simply wanted him to take fewer risks, especially unnecessary ones. That sounds good on paper, but the Penguins found out that Letang didn’t come with a medium setting. It’s all or nothing. There’s little room for interpretation. I'm not asking for odds that it will happen. I know that is zero. I'm calling for an over/under of the number of times people on this board and other social media call for the Pens to go for it. I'm not being at all serious. Just joking about the fact that every time a big name looks to be coming available, you get a number of people saying we should go for it (the new shiny toy). This is the most reasonable trade scenario I've seen so far but I don't like throwing in another 1st when you include Tippett. Panthers have a bunch of solid looking prospects so you may be able to push one of those. I know, not Pens related. 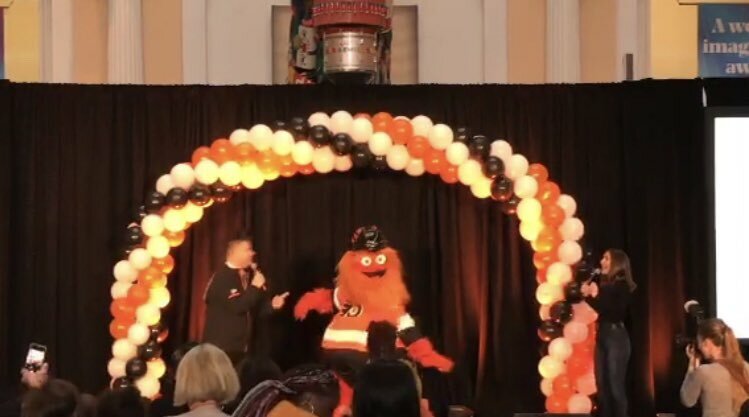 Plan the parade~ Gritty( oh yes), Flyers mascot. Gritty replied: Sleep with one eye open tonight, bird. He looks like Cousin Itt's kid. No offense meant towards Cousin Itt. Animal really let himself go. Slave to Cheetos?